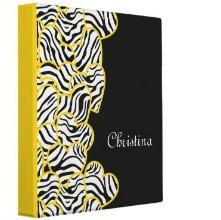 Create eye-catching Avery Custom Signature Binders for home or office with this Zebra hearted binders. Design unique wedding albums, recipe books and photo albums. Showcase your business with custom client binders, proposals and reports. 3-Ring binders include full-bleed, photo-quality printing on the front, back and spine, and 4 pockets. The Avery Signature 1″ Binder comes in two different ring types.